I am finishing up the final details on new needlefelt designs. It never ceases to amaze me how much my art influences my designs and my designs influence my art. The above photo is a detail of a pillow worked in wool yarn on felted wool. When not designing or knitting, I embroider. Inspiration comes from the interior landscape - patterns of the human body as seen through a microscope. This is an image of a healthy red blood cell count. Circles floating and overlapping. Flip the over the pillow front and you have a myelinated optic nerves cut in cross section. Thank you to Florida State University's Psychology Department and Nagoya University School of Medicine Department of Medicine The Branch Hospital for the above medical images . And the cool surprise was to get a copy of the book in the mail to find my pillows on the cover. 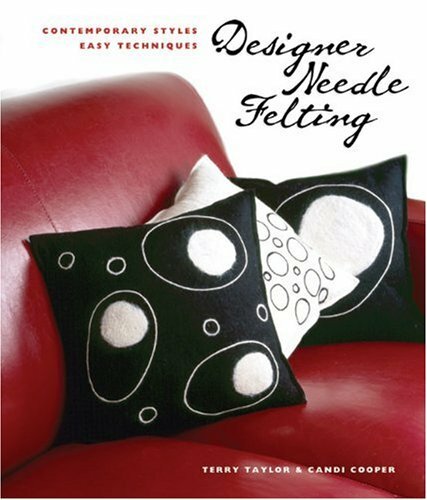 The full pattern and design to make these pillows are included in the book. To order your copy, click on this link.